Britain would be better off leaving the European Union (EU) if the Transatlantic Trade and Investment Partnership (TTIP) is implemented, Nobel-prize winning economist Joseph Stiglitz has said. Stiglitz made the remark at an event hosted by Labour Shadow Chancellor John McDonnell on Wednesday in central London. The evening was part of the Labour Party’s series of seminars on progressive economics. Addressing the crowd, Stiglitz said the restrictive nature of TTIP offers grounds for a Brexit. “I think that the strictures imposed by TTIP would be sufficiently averse to the functioning of government that it would make me think over again about whether membership of the EU was a good idea,” he said. “The dangers to our society are very significant,” he added. TTIP will create the world’s biggest free-trade zone, scrapping tariffs and other obstacles to the trade of goods and services. While its proponents argue the trade deal will encourage investment and create employment, its critics warn it will empower corporations to sue foreign governments that threaten their profits. Central to the US-EU trade deal, is an Investor State Dispute Settlement (ISDS) clause that would give corporations the power to sue governments when policy-makers introduce regulations that could curb their profits. Details of such cases are often shrouded in secrecy, conducted in clandestine court settings. Critics argue TTIP lacks transparency, impinges on sovereign governments’ right to rule in the public interest, and could result in regulators becoming captured. United Nations (UN) figures reveal that US firms have raked in billions of dollars by suing domestic governments to date. Since 2000 alone, American firms have sued states on 130 separate occasions under free-trade agreements. One such firm, Phillip Morris, sued Australia and Uruguay in recent years for placing health warnings on cigarette packets. 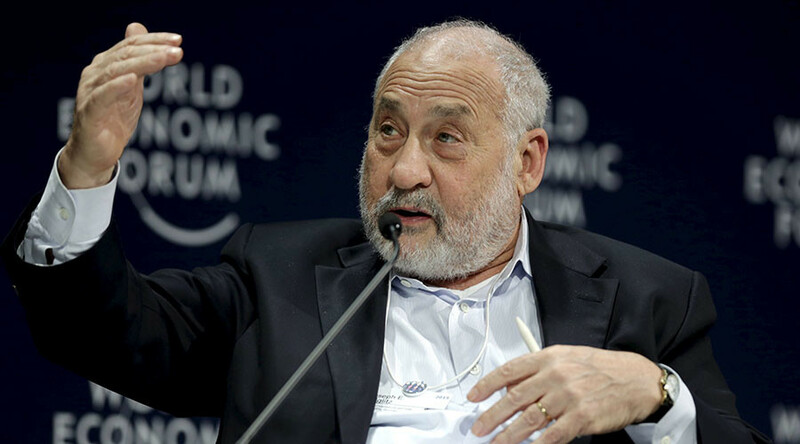 “Every time you passed a regulation against asbestos or anything else, you would be sued,” Stiglitz said. Stiglitz was largely supportive of Britain’s EU membership, highlighting EU states such as Sweden that are part of the bloc but have agreed on separate rules. He argued EU leaders should scrap the euro but keep the union. “There’s no doubt that this toxic trade deal being cooked up in Brussels is driving a lot of people to feel that the UK would be better off outside of the EU, but there’s nothing to suggest that a Brexit wouldn’t prevent something worse taking its place,” he said. Dearden said Europe’s anti-TTIP movement is inspiring. “Millions of people have mobilized across borders to challenge the corporate power grab of TTIP,” he said. A leading aim of TTIP is to open up Europe’s public health, education and water services. Although the European Commission (EC) has said public services will be excluded from TTIP, UK Trade Minister Lord Livingston admitted that talks concerning the NHS were still on the agenda last October. Campaigners are concerned about TTIP’s “regulatory convergence” agenda, which will seek to bring EU standards on food safety closer to those seen in the US. Because US regulations are generally less rigid than their European counterparts, campaigners are worried about a decline in food standards across Europe. They argue European food markets could be flooded with genetically modified products and foods doused in hormones and pesticides after TTIP is implemented. As TTIP negotiations continue to play out behind closed doors, the City of London is thought to be lobbying for US banking regulations to be softened. America’s financial regulations are more robust than those seen in Britain, and were put in place in the wake of the 2007/08 global financial crisis. Ethical finance campaigners fear TTIP will scrap these measures and restrictions, handing power back to bankers in the process. Campaigners are also worried about rising levels of unemployment. Last year, Brussels admitted that TTIP could cause considerable levels of joblessness. It has advised EU members on how to deal with increased levels of unemployment after TTIP comes into force.